The Syrian revolution let people be artistic and creative. Four years later, the art has not stopped. With the uprising in Syria came a lot of artistic expression. There were political posters, cartoons, graffiti, film, photography, poetry, music. But this was more than just protest. Art was a way of keeping alive the nonviolent spirit of the beginning of the revolution. Syria had been silent for a long time. Now all the visual art was shown on YouTube. Since those first videos, Syria’s citizen journalists have become far more professional – there are now underground newspapers and radio stations all over the country. There are many new photographers who have started the Young Lens collectives, sharing photos of the war on Facebook. (See image above). More than four million Syrians are now living as refugees. So many people who spoke out in 2011 and 2012 are now in exile. But the creativity has not finished. Kartoneh is a group of artists from Deir al-Zour, eastern Syria. 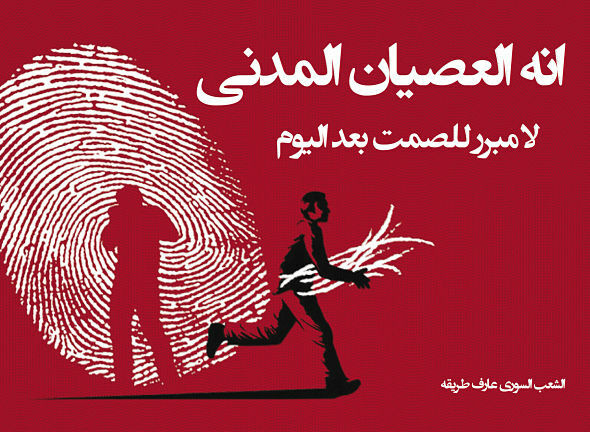 They showed posters on Facebook in the early days of the uprising. The posters were part of a big nonviolent fight to stop sectarian groups taking over the revolution. The city is now under control of ISIS, and the collective still puts pictures on Facebook. In Daraya, Damascus, young people have built a library from more than 11,000 books found in the bombed buildings. And in the Palestinian refugee camp of Yarmouk, Ayham Ahmed has played an old piano for three years. The piano was set on fire by Islamist militants in April this year, but Ayham has found a keyboard so he can keep singing with the children in the camp. This summer, a film producer, Qusai Hayani, made a television series – a drama-political satire – in the ruins of Aleppo (controlled by the rebels). The show, called ‘Banned in Syria’, laughs at Assad’s government and also at the rebels of the Free Syria Army. In June, one of the people looking for film locations for Hayani was shot dead by a government soldier. But filming continued. When they stopped for a break, one of the actors – Jihad Saka Abu Joud – sang revolutionary songs in the bombed streets of Aleppo. ‘Masturbation’: Sulafa Hijazi is a digital artist. His pictures show the male, military culture and the terrible prisons. 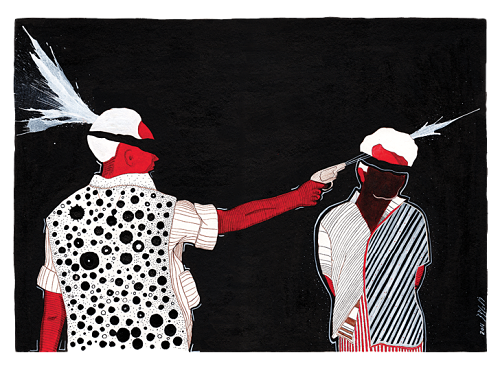 ‘Our Saigon Execution’: Khalil Younes looks at violence to the human body and the psychology of violence. ‘Waiting’: Young Lens groups have shown every stage of the conflict. The pictures, by citizen photographers, are clear – eg. tank tracks, a man cleaning a gun with a toothbrush, a living room with a hole from a bomb in the roof. 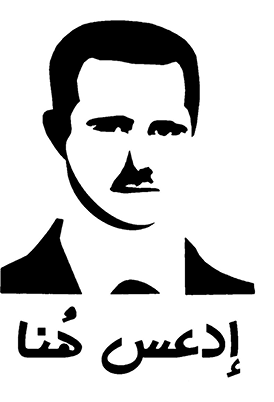 Alaa Ghazal made this stencil of Assad, with the words ‘Step here’, and put it on Facebook. The man who has been on Syria’s walls for so long can now be sprayed onto the pavements. 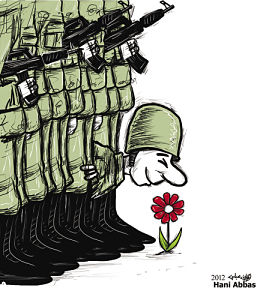 Hani Abbas is one of Syria’s great cartoonists. Here, Hani shows the government soldiers as ordinary people - trying hard not to run away to freedom. 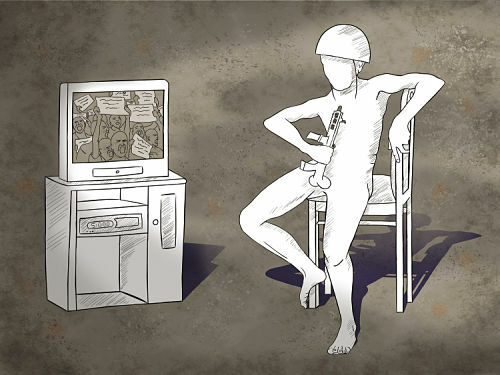 Ali Ferzat has used satire to get his cartoons past the censors of the state since the 1970s. When the revolution started, he began to be more direct. In the spring of 2011, for example, he drew Assad trying to get a ride in the getaway car of a desperate Muammar Qadafi. In August, masked men from the government security services attacked Ferzat and broke his hands. He now lives in exile in Kuwait. 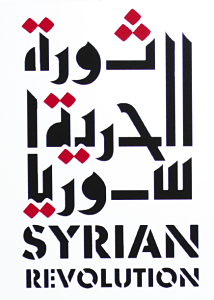 Many of the ideas and pictures here are from Syria Speaks (Saqi Books, 2014), edited by Malu Halasa, Zaher Omareen and Nawara Mahfoud. NOW READ THE ORIGINAL: http://newint.org/features/2015/09/01/syrian-revolution-and-thekingdom-of-silence/ (This article has been simplified so the words, text structure and quotes may have been changed). This page was last edited on 29 September 2015, at 14:49.